This book was first written in 1986, and hasn’t been updated since 1992, so it’s a little outdated — and that’s a shame. However, it is still an excellent reference for those interested in learning more about different types of grapes, and at less than twenty bucks is a bargain compared to the newer and shinier books available. Do not buy this book if you want to see beautiful photography — there isn’t any. All the images are hand-drawn illustrations, mostly of wine maps and grape bunches (including leaves). DO buy this book if you are an intellectual, and looking for a “textbook” on grapes. Author Jancis Robinson — a Master of Wine and one of the most respected wine educators in the world — does a great job of presenting hard facts intertwined with bits of opinion in this remarkably researched book. No grape goes unturned, as Robinson describes nearly every vine variety on the planet, and its relationship to the soils and regions. Though it would be nice to see a new edition of this wine book, it has several timeless qualities. The first, 38-page chapter (“Where Grapes Grow and Why”) is fundamental to understanding wine and essential reading for anyone looking to further their wine education. Along the same vein (or vine? ), Robinson fully profiles the “classic” grape varieties, going into great detail regarding history, development, and characteristics of each. Bottom line — this is will be somewhat dry for those looking for light reading and pretty pictures, but is an excellent reference for people who are serious about furthering their wine education and getting a more intellectual understanding of wine. When I first started getting into wine, I didn’t even know there were different grapes. Well that’s not entirely true — I knew there was a difference between the seedless grapes I bought at the supermarket, and the “wine grapes” my grandfather grew in the backyard. But that was about it. Needless (or seedless) to say, I was indelibly blessed when someone handed me the Wine for Dummies book — it was without a doubt the singlemost important educational wine resource for me at the time (back then, there was maybe two references to wine on the internet). More than ten years later, I still think it is a fantastic first book for wine neophytes, and that “reference for the rest of us” still rings true, as I frequently flip through my cover-worn copy to look up things. If you are a wine beginner and hungry for information, this is one of the first books to consider. The text is friendly, fun, and easy to read, as authors Mary Ewing-Mulligan and Ed McCarthy do a wonderful job of teaching without preaching and devoid of pretense. What I find particularly helpful is the way the information is organized and the order it is presented — it’s step by step, yet you can skip around without missing anything. Further, after reading just few chapters you’re already empowered enough to confidently step into a wine shop or peruse a restaurant wine list. Recommended reading for all wine newbies. Folks in the NYC area may want to attend this Champagne tasting to benefit the Living Beyond Breast Cancer organization. The event — sponsored by Riedel Crystal — takes place on September 27th (next week!) from 5pm to 8pm at New York’s hottest Greek restaurant, Parea, on 36 East 20th St. Besides benefitting a great cause, you will have the chance to taste top Champagnes from major houses such as Moet & Chandon, Gosset, Mumm, Perrier-Jouet, and Pommery — to name a few. In addition, Maximilian Riedel of Riedel Crystal America will be at the event to premiere Riedel’s new, Pink, “O” Champagne glass — the sales of which will benefit charity. If you’ve seen / used the new “O” series, you know they’re pretty cool; they have no stems (which is a problem for people who want to look good sticking their pinky out when holding their glass). 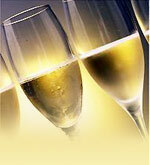 All guests will receive a free “O” glass to taste the Champagnes, and you’ll get to sample Parea’s great hors d’oeuvres. If you can get to this event, do it … it’s not often you get a chance to taste so many awesome Champagnes at one time. It will be a great chance to do real comparison tasting between bubbles … and you’ll be helping the Living Beyond Breast Cancer as well (see their website at www.lbbc.org). Who knows, you might even bump into Vino Joe at the event! Contact the LBBC at 610-645-4567 or email Marcia@lbbc.org for tickets. Get the tickets in advance and they’re only $150; otherwise you’ll pay $175 at the door. Considering that it would cost a heckuva lot more for you to buy and uncork all of the Champagnes you’ll have the opportunity to taste (not to mention the high-class eats), this is a bargain. This post has absolutely nothing to do with wine. 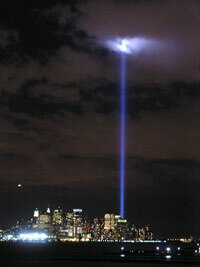 For those of you around the USA who might have liked to see the World Trade Center memorial lights, but weren’t anywhere near New York City, here is a photograph from my digital camera. I apologize for not being a better photographer, and not having a better shot, but this is the angle I had from my home on the Jersey side of the Hudson River. Feel free to download and share. Contact me if you want the original. Most importantly, please take a moment to think about the lives lost, the families left behind, the heroes of that day, and the soldiers who continue to give their lives for our country. And let’s all pray for peace. In just a few days … Thursday November 17th to be exact … Beaujolais Nouveau 2005 is arriving. If you were invited to an “arrival party”, then you might already know this. To refresh your memory, Beaujolais Nouveau is the first wine of the vintage, and will be arriving amidst much pomp and circumstance later this week. Why all the hoopla? What makes Beaujolais Nouveau so special? In the Wine Basics section, there is a new page with a quick summary on Beaujolais Nouveau. Click here to find the answers to your Beaujolais Nouveau questions.